Optical illusions are well, illusions. They are created by simple manipulations of lines, colors and patterns to confuse our brains while receiving sensory inputs, thus messing up with the output. With each passing day, optical illusions are increasingly being used in art, entertainment and e ven in scientific audience-driven endeavours. Playing with perspective is the biggest operating force behind any work of art. Since time immemorial, artists have been coming up with blazing new ideas and techniques to demand full sensory engagement from the viewers – something that would give a big jerk to their brains and make them go ‘Whoa!’. 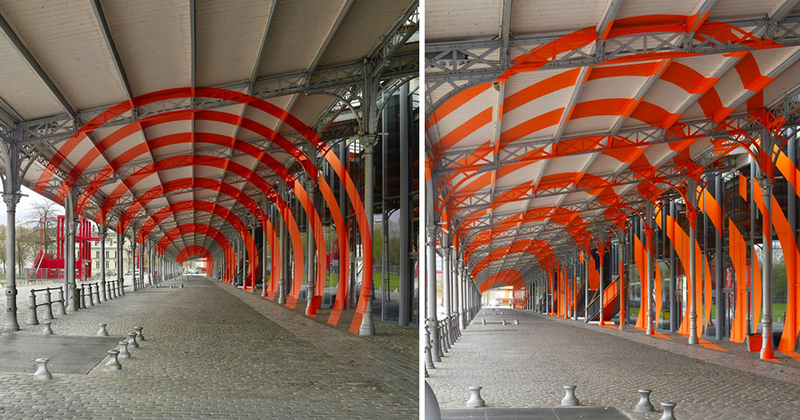 Here is a list of 10 such installations with optical illusions that will simply and literally sweep you off your feet. Calling them ‘ghost buses’ won’t do justice to these beautiful old trolleybuses with 3D prints which make them a part of the city streets. For this is the tribute paid by Lithuanian artist Liudas Parulskis and Studio Vieta to the city heritage of Vilnius. The photorealistic printed imagery mounted to the exteriors of the buses on the occasion of the 2016 Vilnius Street Art Festival would form the scenery beyond along with the vanishing point at the right moment, thus camouflaging the buses. Most buses capture specific street scenes, while one has an imagery of the local traditional architecture. Another bus has a wolf, a traditional mascot of the city, running across the intersection. This is , urm , not for the light-hearted. It is for the fun-loving ones who are okay with making people scared of falling down the moment they enter a room. 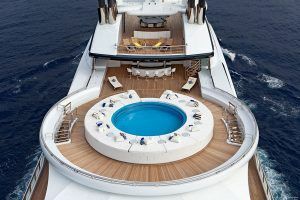 This vertigo-inducing warped floor system has been designed by British company Casa Ceramica. Their entryway in their Manchester showroom is designed so as to give an otherworldly appearance to an otherwise traditional setting. 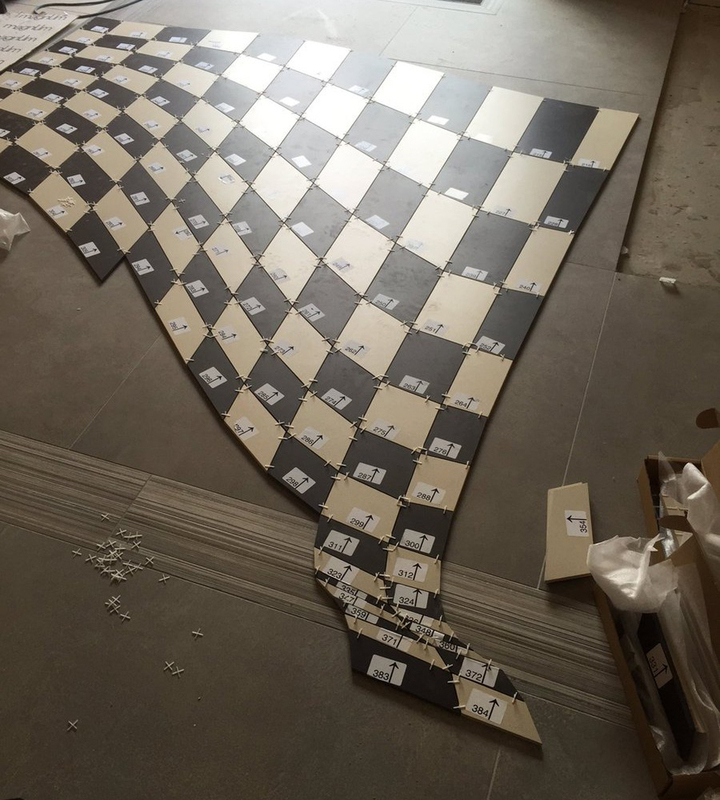 Flooring with such design is for the specific purpose of slowing people down while they are walking over it. As the forced perspective works in only one direction, one shouldn’t worry about finding their way back. 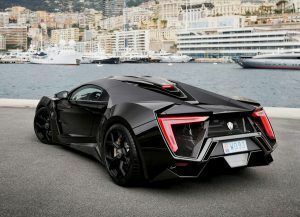 According to a company source, the inspiration was to change how tiles are viewed and used. Check more photos. 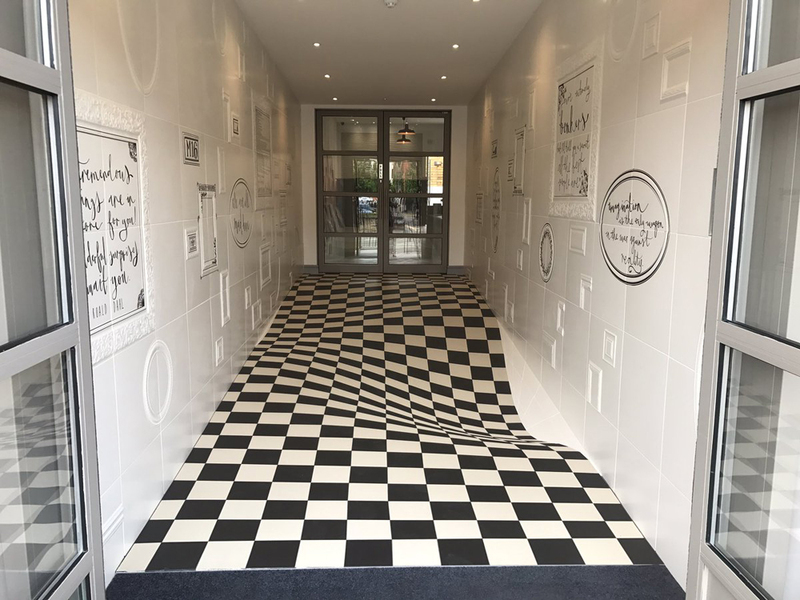 After tiles that make your world go literally haywire, here is a zebra walk that would make you feel as if you are hovering on air. 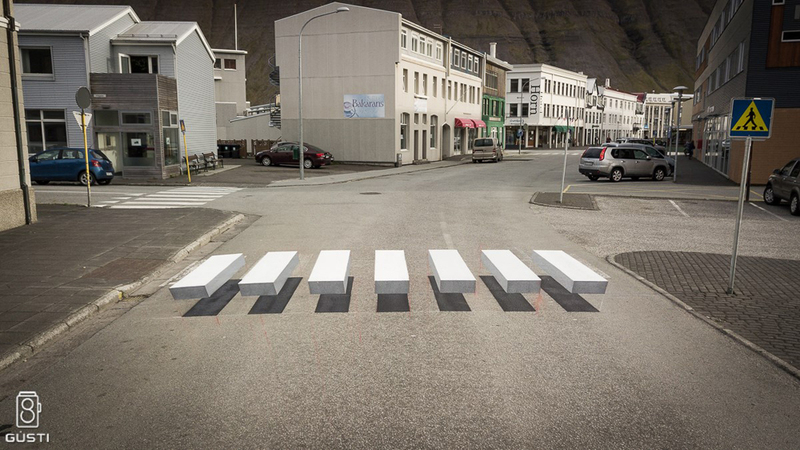 The three-dimensional aspect has completely jazzed up the innocent traditional zebra walk in the quaint fishing town of Isafjordur in Iceland. 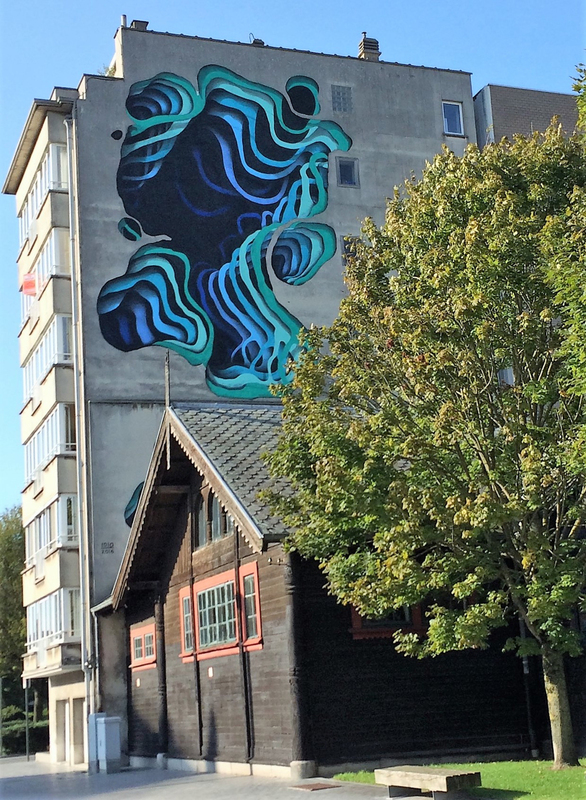 It was created in September this year as a collaboration between the city’s environmental commissioner Ralk Trylla and street art firm Vegi GIH. 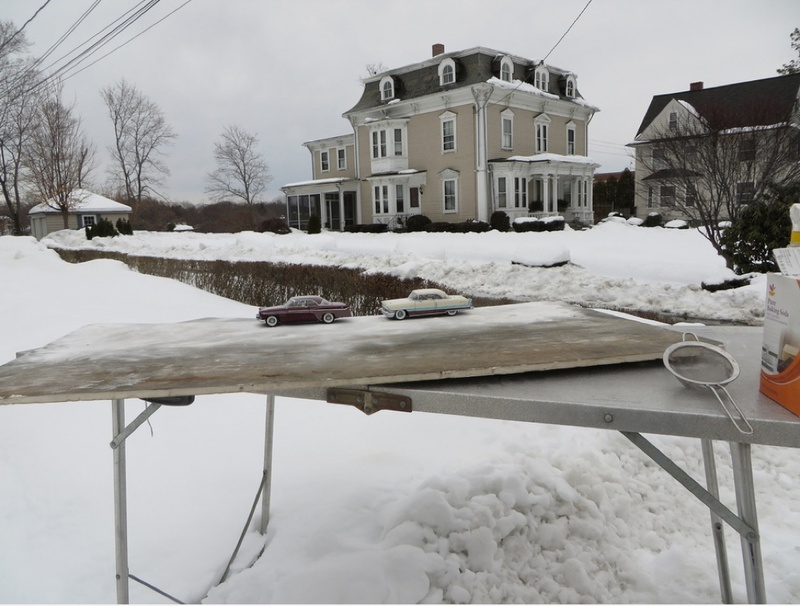 They attempted to enhance both the city’s aesthetic value and to remind motorists to slow down at the crosswalk and in the narrow residential streets. Apparently, the idea was inspired by measures taken in New Delhi during brainstorming sessions to make the roads more disciplined. 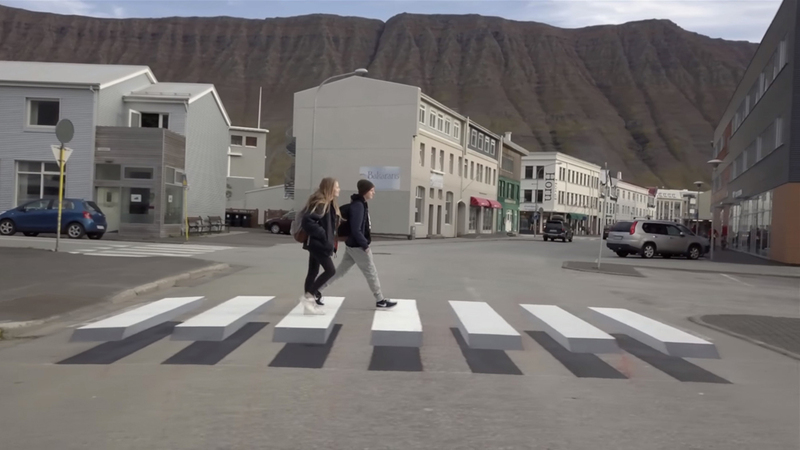 If this experiment proves successful, more such crosswalks would be created. 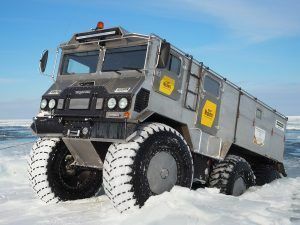 Check more photos. 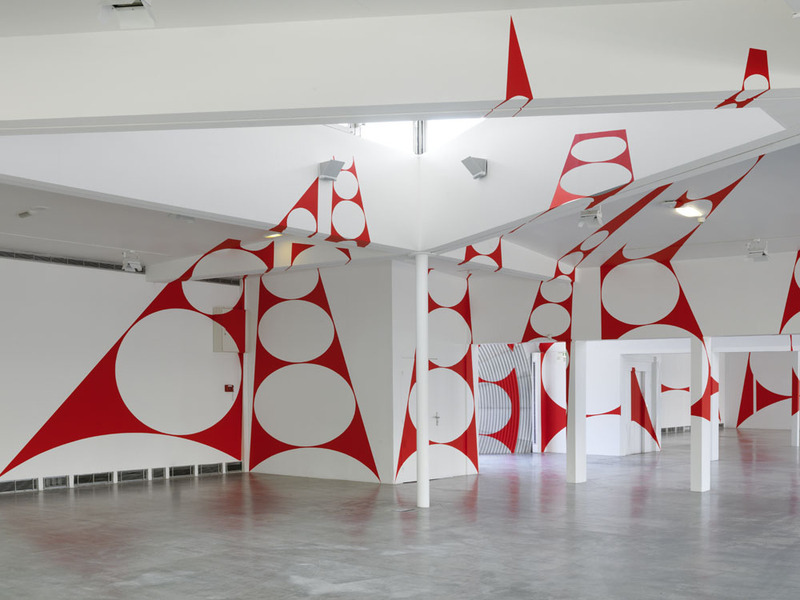 The La Villette En Suites is a 2015 solo exhibition of Swiss artist Felice Varini which used anamorphic projections. These when viewed together from a single location would create an uncanny feeling. Varini being an architecture enthusiast, uses unconventional spaces with varying depths to create new geometric pieces, which are basically paintings. These installations were available both in the interior and the exterior of the Grande Halle de la Villette within Parc de la Villette from 15th April to 13th September 2015. Those pieces were made with projectors and stencils and the illusion was recognized only when viewed from a certain point. In 2013, his work was featured at the Grand Palais in Paris. 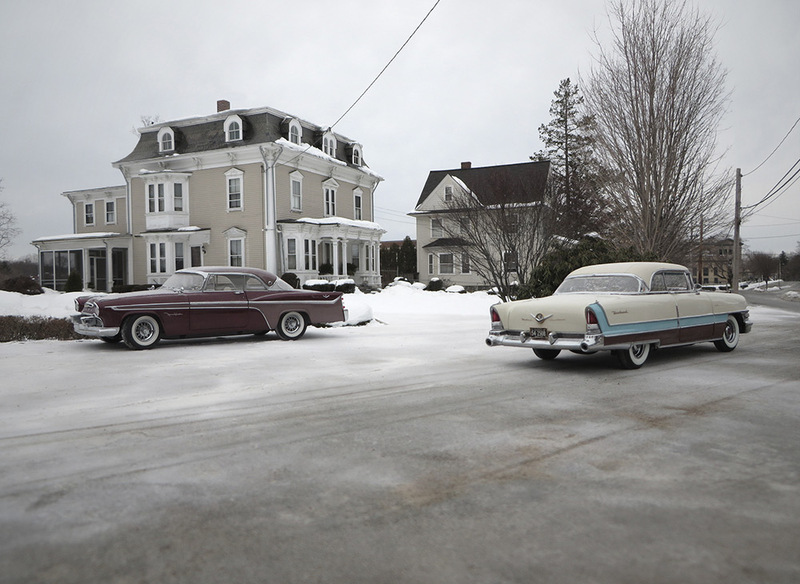 Elgin Park is a fictional 20th century town created by photographer Michael Paul Smith inspired by his colorful life and the challenges he overcame. 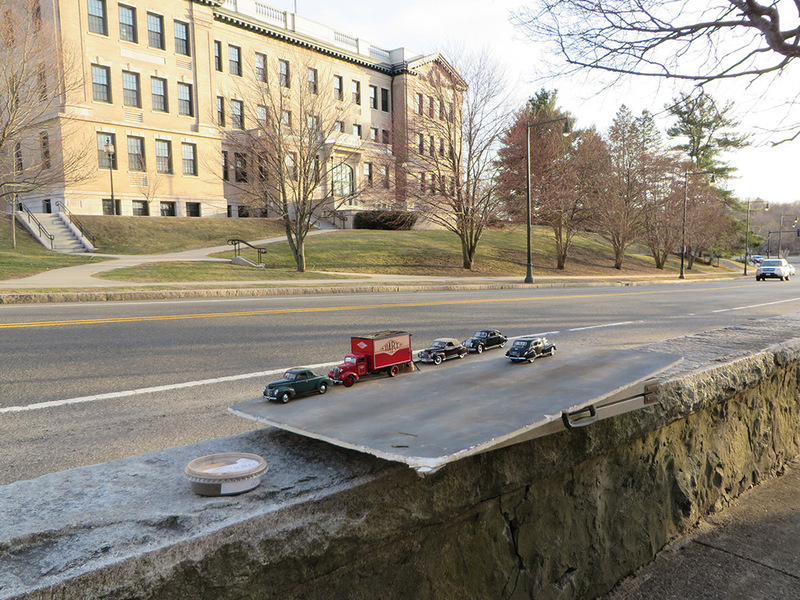 Using an optical illusion known as forced perspective, he creates the illusion of a city through carefully modelled die-cut automobiles in a miniature 1/24th scale. Except for the cars, everything on the set has been created by hand, and Smith used an ordinary compact camera to capture those images. 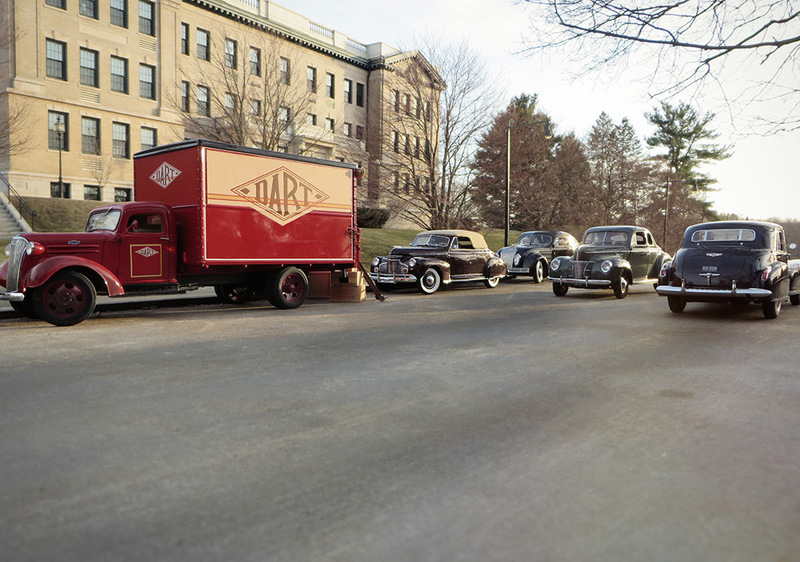 The snapshots look like straight out of an old photo album. Which is because Smith imagines Elgin Park to be a town of the 1950s. This has become such a huge hit with fans that the photos got 70 million views in his Flickr account alone. 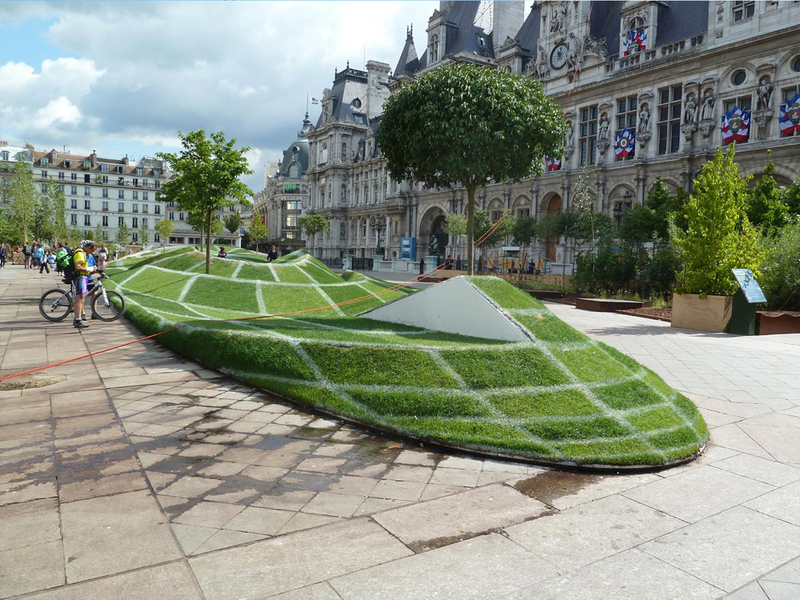 Called ‘Qui croire?’ in French, this landscape installation by Francois Abelanet was commissioned by the city of Paris to celebrate ‘A season under the trees’. If you look from a specific angle and height, it would seem like a globe with some trees on top of it. In reality, though, it is a 1500 square meter sprawling installation. 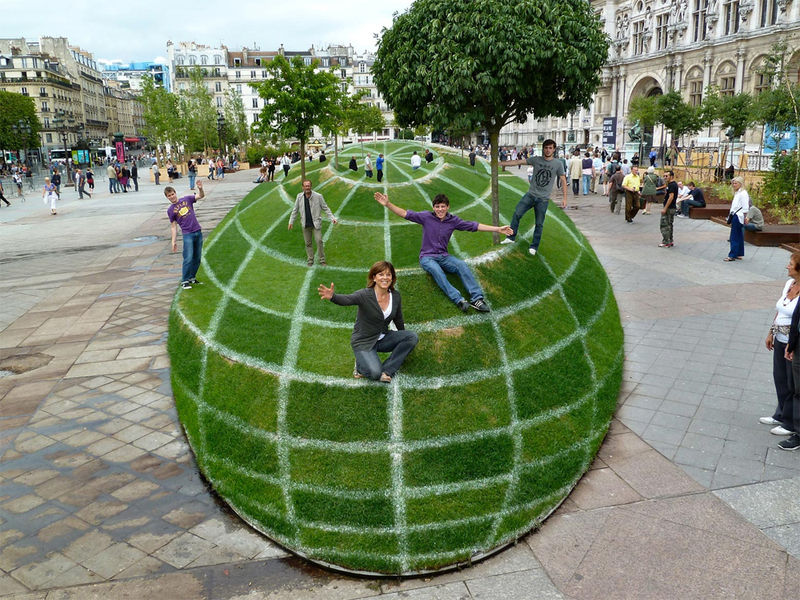 According to the website of the artist, it took many hours, soil managing instruments, laser pointers and GPS locators to make this ‘anamorphosis’. It took 5 days and 90 people to create this installation 100 metres in length and spanning 1200 metres of square lawn, 300 square metres of the coverplant sedum and 650 cubic metres of sand and straw. Before this, Abelanet had created an illusion called ‘Drops in Doubt’ among others in the empty moat of Chateau d’Angers. It is designed to give the feeling of water drops on the now-defunct moat. This is one for which you need to look down, literally, like say more than 10 feet. For if you walk by this installation, you would see only a few pleasant colorful blobs. 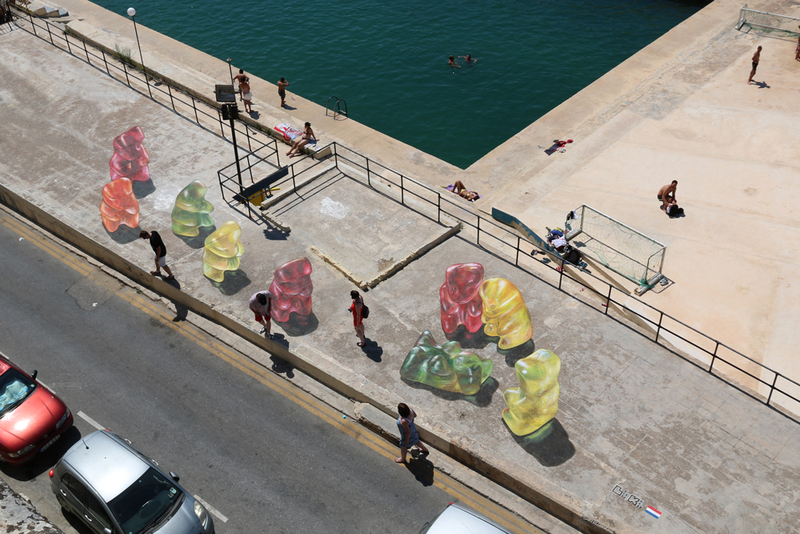 It is only after you gain some elevation would the scene unfold before your eyes – a giant green gummy bear lying under the hot Maltese sun and three gummy bears mourning over him, while five more are approaching the scene looking bereaved. And then you would see fellow humans having the time of their lives by the beach, totally unaware of the tragedy that has unfolded. 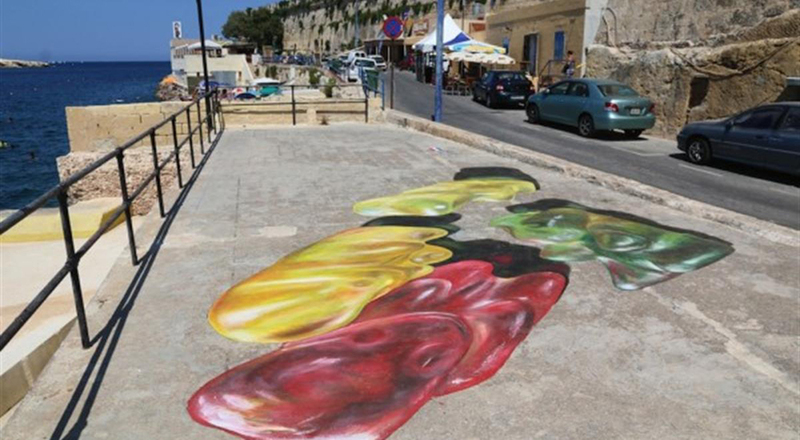 The artist behind this riveting statement showcased in the 2015 Malta Street Art Festival is Leon Keer from The Netherlands, who is famous for his realism. Apart from being one of the world’s leading anamorphic street artists, he is also a painter. 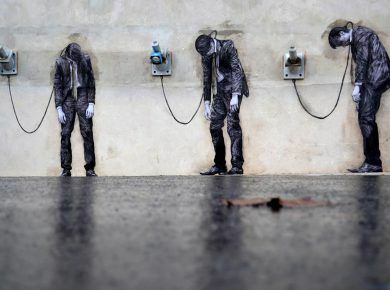 Street artist 1010 is not your Banksy with his subversive political commentary. 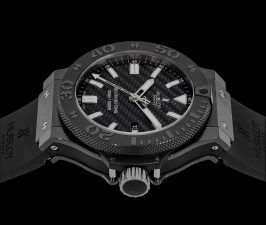 While we don’t know much about them, we know for certain that coming across one of 1010’s many creations can be quite unnerving as they are both beautiful and grotesque. For 1010 uses the trompe l’oiel technique to give a feeling of three-dimensionality. 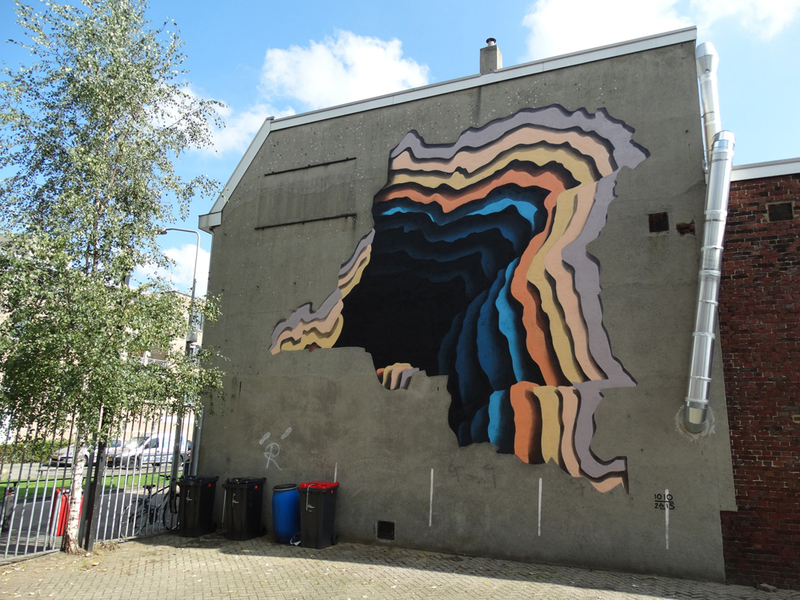 His large-scale creations with spray paints on building walls consist of concentric layers of many colors. These create the illusion of receding into another unknown dark dimension. While this gives the impression of the buildings rupturing, the vivid colors and striking organic designs never fail to impress. 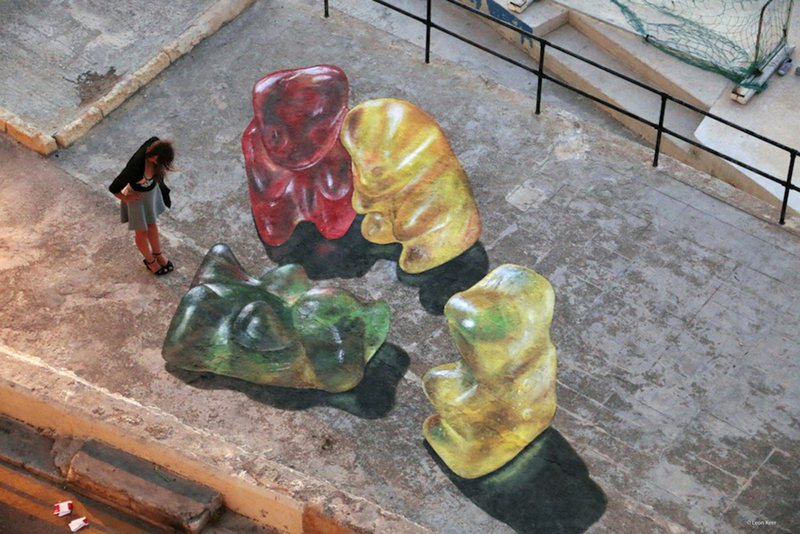 Of late, this Hamburg-based artist’s work has appeared in Miami, Dubai and San Francisco. Check more photos. 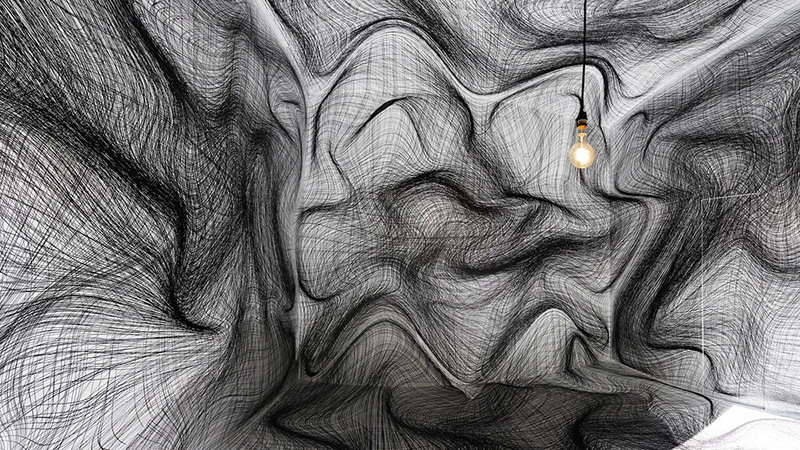 Want to experience how simple lines can make you tipsy? 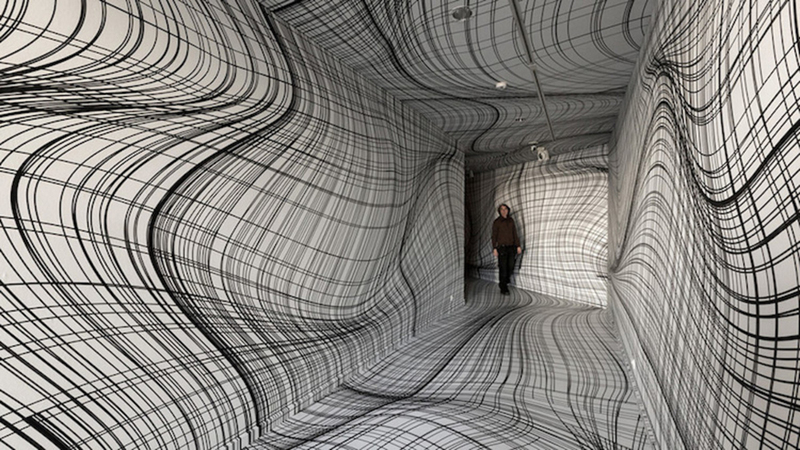 There is Peter Kogler from Austria for you with his mind-boggling, psychedelic optical illusions. Kogler loves bending time and space, which he does most interestingly. He transforms flat floors and white walls of galleries, transit stations and lobbies into something trippy. He uses entirely two- dimensional, simple lines and bold graphics to befuddle perspectives and alter your set notions of architecture so that floors rise, ceilings curve and walls bend. Unless you lose your balance right at the beginning and fall over, you would get to experience and interact with your surroundings like never before. 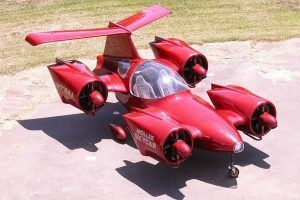 Kogler regularly showcases his art in galleries across the world. This is some more art to do away with your sense of coordination altogether. 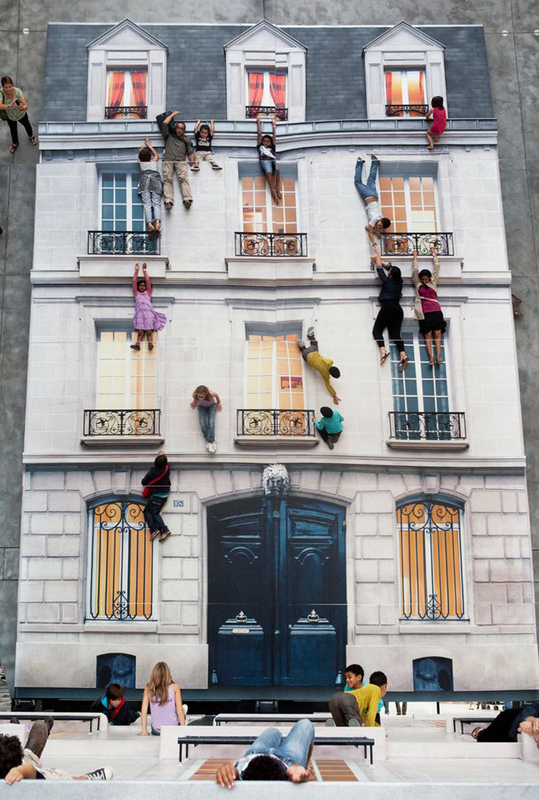 For Leandro Erlich, an artist from Argentina, gives an interactive experience to participants who get the illusion of sitting on ledges, dangling and scaling the sides of buildings. 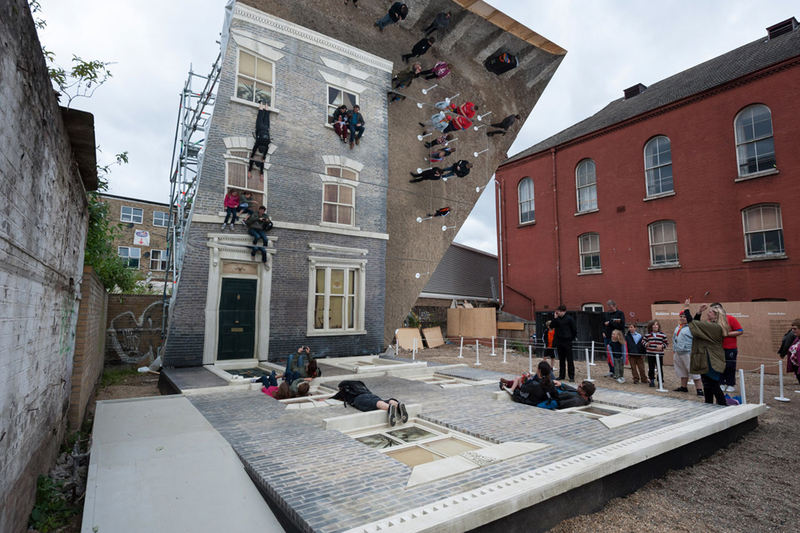 Known as Dalston House, it allowed people young and old to have the thrill of performing some of the most daring stunts all the while remaining safely on the ground. Dalston House was a temporary installation in Hackney and was commissioned by the Barbican gallery. The brick walls and the window design of the three-story exterior were made to resemble the many nineteenth-century Victorian terraces lining the neighbouring streets of the area. The façade lies face-up, with a mirror positioned at 45 degrees to reflect the going on below. Many of these optical illusions are probably making you dizzy just by being on the screen. Optical illusions are fun, but they have been known to cause momentary discomfort, especially among people with sensory disorders or fluctuating blood pressures. 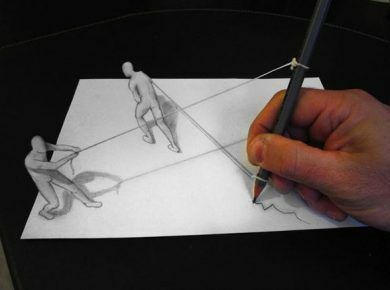 Nevertheless, what these artists are doing is just amazing. Often, the statements made through these are deceptively political. And most importantly, they show a very clever usage of the brain. And so these are to be thoroughly enjoyed whenever possible.